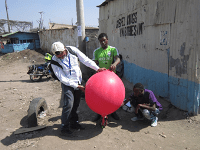 The staffs involved in this team contribute to the overall multidisciplinary efforts of the Urban Zoonoses project by asking pertinent questions that allows measuring, mapping, monitoring and mitigating drivers behind the emergence of zoonotic and food-borne diseases in urban and peri-urban Nairobi, Kenya. 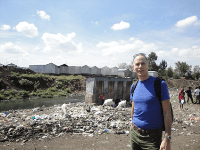 Particularly, we will continue to explore human-environment interfaces in selected low income areas of Nairobi, with specific attention to how local environmental hazards interact with food preparation/consumption and livestock keeping practices, and how this in turn may result in greater exposure and vulnerability by people and places to potential exposure to certain zoonotic diseases. We will also analyse relevant policies, institutions and officials’ perceptions that either promote or constrain better practices and initiatives. 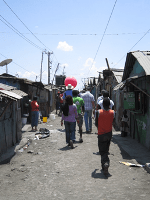 We will continue to explore human-environment interfaces in more informal settlements in Nairobi, with specific attention to how local environmental hazards interact with food preparation/consumption and livestock keeping practices, and how this in turn may result in greater exposure and vulnerability to pathogens that leads to arrays of communicable diseases. For more details and current activities, please visit the project micro-site in DPU(coming soon). The Planning, policy and social sciences thread of the project comprises of colleagues from the two world renowned Faculties at the University College London(UCL) : Bartlett’s Development Planning Unit (DPU), and Civil, Environmental & Geomatic Engineering (CEGE), along with International Institute for Environment and Development (IIED), London, United Kingdom. Sohel Ahmed PhD, postdoctoral researcher, at DPU, UCL. Professor Julio D Davila, Director, DPU, UCL. Professor Adriana Allen, DPU, UCL. Cecilia Tacoli PhD, Human Settlements Group, IIED. Additional funding and partners: Apart from primary funding of the project from MRC, the team also secured co-funding from the Department for International Development (UKAID) which enabled them to involve more partners that include Muungano wa Wanavijiji, the Kenyan federation of the Urban Poor, and City and Regional Planning, University of California Berkley, USA.